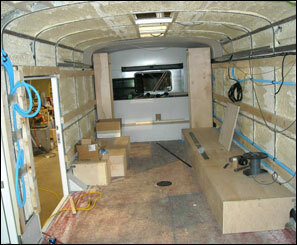 Celebrate your new Bookmobile on April 20th from 5pm – 7pm at Steele Memorial Library, 101 E. Church Street Elmira, NY. Come by for food, fun, and a chance to check out our new wheels. If you can’t make the event then check out our new wheels at one of our community stops. Chemung County Library District (CCLD) is pleased to announce the official unveiling of its newest portable branch, the Bookmobile, a 34 foot long vehicle designed by OBS, Inc. of Canton, Ohio. 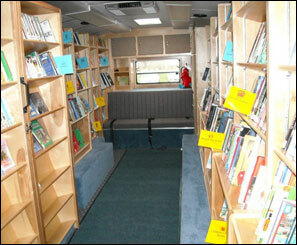 Since 1949 bookmobile services have been offered in Chemung County. It has played an important outreach role, connecting new users and raising awareness of library services throughout the county. The new Bookmobile offers many of the same services that patrons find in their community libraries, including popular materials, story times, class visits, and participation in community events. It serves communities with collections that include materials for children, teens and adults. 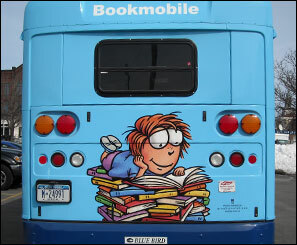 The bookmobile travels 11,000 miles per year, loans out over 16,000 items, provided 198 programs where over 3,500 people attended- despite being off the road for almost 5 months. 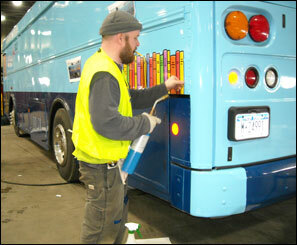 The new Bookmobile features state-of-the-art equipment and technology including the use of low-sulphur fuel; ADA compliant with wheelchair access; low bench seating and an awning for outdoor community meeting space, improving access for class visits, story times, and other popular programs and events; and flexible shelving, allowing for rotating collections and programs. This entry was posted in Bookmobile, Community, District News, Uncategorized and tagged Bookmobile by ccld. Bookmark the permalink. Next → Next post: Which is better…the book or the movie?